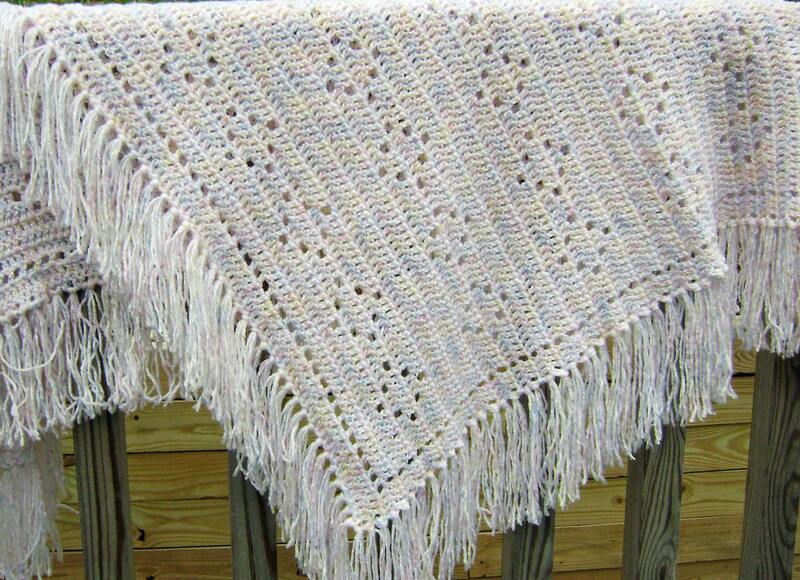 Love my Twinkle afghan pattern but don’t have time to crochet it yourself? No problem, I can create one for you. To be made with Powder Pink Twinkle yarn, this gorgeous afghan will measure a generous 33 by 38 inches (approximately 84 by 96 ½ cm). It is fringed on all sides. There’s almost a full skein of yarn used just in the fringe. The yarn is called twinkle because it has nylon threads of a darker pink, blue and yellow woven in with the light powder pink acrylic background yarn. These threads catch the light and make the afghan “twinkle”. The yarn is sport weight, 67% acrylic and 33 % nylon, making the afghan machine washable. Allow four weeks for completion. Made by my own hands in my smoke free, dog friendly home. Care instructions: machine wash, gentle cycle with mild detergent. Machine dry on low, or allow to air dry. Shipping: The afghan will be shipped via USPS Priority Mail with delivery confirmation to customers within the US.